Representing over 300 businesses in Brooklyn�s vibrant Brooklyn Heights, Boerum Hill and Cobble Hill neighborhoods, the Atlantic Avenue Business Improvement District (AABID)provides local businesses with a variety of services, including marketing and promotion of the business boulevard; capital improvements, streetscape and beautification projects; advocacy and other programs and business services that improve economic conditions. To learn more about the Atlantic Avenue BID visit http://www.atlanticavebid.org/. 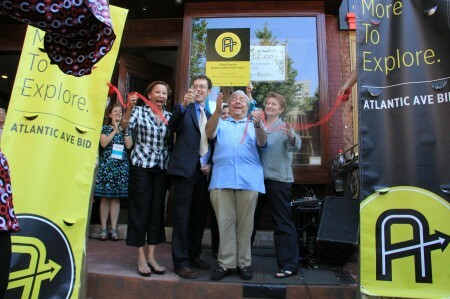 (Congresswoman Nydia Velazquez, BID director Josef Szende, Brooklyn Borough President Marty Markowitz at the ribbon cutting during the extravaganza). The first-ever Atlantic Avenue Extravaganza presented by PKPR client, Atlantic Avenue Business Improvement District, was a resounding success. Celebrating the launch of the BID, a coalition of three hundred businesses along one of Brooklyn’s most famous boulevards hit the streets, literally bringing their business outside! A jam-packed lineup of special events, performances, demonstrations, tastings, tours, games, and more brought Atlantic Avenue’s celebrated commerce, culture, and community to life. PKPR made sure that the streets were bustling by securing coverage in Time Out New York’s Best of the Fests, amNY, Flavorpill , New York Post’s Hot Picks, New York Times, Brooklyn Exposed, Brooklyn Bugle, New York’s Grub Street, and many more!